Sorry for the late post my readers. This is the fourth week of 20Sweatin’ and I hope you guys are getting things done. Anyway, to the News! A British scientist thinks that if we use acoustic gravity wave or AGWs we will be able to somehow stop tsunamis. I have no idea how, but I’m imagining a giant guitar fist fighting a sentient wave. Canada is currently listed as the ninth most corrupt nation in the world. Don’t worry this is a good thing. It’s out of all nations so ninth is good. 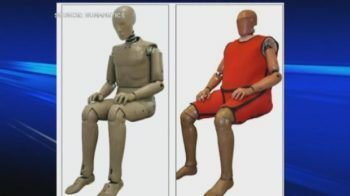 Crash-test dummies have been redesigned recently because America is fat and normal crash-test dummies don’t accurately represent the American population anymore. A New Zealand man has been fined $100 for shooting McDonald’s employees with a nerf gun after they did not give him his nuggets fast enough. This weeks Hypes & Gripes is the people in the states who feel that they were supposed to be merfolk instead of people. I am not a fan of theirs. Florida Man is back at it: this week he stuck a mop to his head and ran around his neighbourhood knocking on doors demanding eggs. Prince had roughly $800,000-1,000,000 worth of gold bars in his house upon his death. This weeks lead story: tablets for blind people. Our old news story is that a Pennsylvanian man in 1893 had a pitcher that had been on the Mayflower. Gait improving robot pants and black magic nerd glasses also happened in the news this week. A mall in Pennsylvania got auctioned off today for one hundred smakaroos. I wonder how much the insurance is. A Cincinnati man does not want any more television suggestions so leave him alone guys. The Han Solo story has been delayed to when you think it will be released: December 2018. A robot has been invented and named Kuri. It beep-bops and it’s a little adorable. Lastly, there are some new wind turbine designs that look like hummingbird wings. That’s all the news I hope you enjoyed the show and I’ll talk to you next week now.